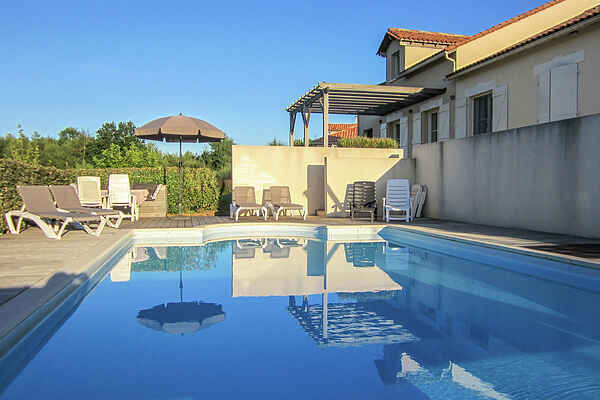 This lovely villa is located at Domaine de la Haute Preze. This small-scale estate is set among hills in the middle of the golf course, surrounded by forest (first tee is 500 metres away). The villa is spacious, so you have lots of privacy. There is a living room with a cosy open fireplace, wonderful for relaxing in cooler weather. The fully equipped open-plan kitchen turns cooking any meal into a party, and passionate cooks will have a great time trying out their recipes here. A staircase leads to the mezzanine, where you will find a TV, a DVD player and a CD player. There also books and games here. From the living room you walk through the French doors onto a large terrace with a panoramic view. The terrace is equipped with a garden table, chairs and a charcoal barbecue grill. Stairs lead down to the lower wooden deck with sun loungers, a dining table and chairs a wonderful spot for combining swimming and relaxing. The private swimming pool is spacious (10 x 5 metres with a maximum depth of 1.80 metres), so you have plenty of room to swim. There is a large lawn at the front and side of the villa, great for playing boules, badminton and other outdoor games. If you like tranquillity in a lovely setting with plenty of privacy and luxury then you have come to the right place!